I Didn't Get Selected :( - But not all was lost! Well, the bad news (for me) is that after sitting in the court room all day, I *didn't* get selected to serve on the Jury. They seated a jury of 13 (12 plus 1 alternate) before my name was ever called. I had to sit there through the process, which oddly enough, I really enjoyed! Since I had never been called for Jury Duty before I didn't know what to expect. It was definitely an eye-opening experience. I thought you might enjoy me walking you through steps. Around 9:00 two bailiffs began taking roll. They had everyone's name and address individually on a slip of paper. If you were present when they called your name your slip was put into a box that they would later randomly draw names from. People who drove more than 10 miles were told to tell them how far they had driven, as they would be reimbursed for mileage. If there were any address corrections, you simply informed the bailiff. Some people had changed their name since they had registered to vote (marriage, divorce, etc) - they were instructed to inform the judge of this in the event they were selected. Finally the roll call was finished and the box had about 40 names in it from the people who had shown up. (I don't know what happened to the people who didn't show up - maybe nothing?) We waited a little longer and the attorneys for the two sides trickled in and then we were instructed to "all rise" as the the judge came in. Before the jury selection process began he asked if anyone felt like they should be excused from serving. A few people made their way up to the front and spoke with him individually. A couple of people were excused, but most came back to their seats, obviously not having convinced him of the legitimacy of their excuse! What do you do for a living? How long have you done that? Who is your employer? Before that what did you do? And for how long? Are you married? Who are you married to? What does he/she do? Do you have any children? What are their ages? Ever served as a juror before? What type of jury was it? Did you have to make a decision in that case? Did the jury decide for the defendant or plaintiff? Did your experience in that trial affect your ability to render a fair verdict in this case? Have you ever been involved in a lawsuit? What type of lawsuit? Was it litigated to a judgment? Would your experience affect your ability to determine the facts of this case and offer a fair finding of fact? Is there any reason you could not or should not serve as a jurror? Obviously it took a LONG time to go through 14 people, asking them individually these questions. Then each of the attorneys got up in turn, briefly stated their summary of the case and proceeded to ask follow-up questions of the potential jurors, obviously trying to determine the kind of juror the person would be, and if they would have a leaning towards their side of the case. As the people answered you could sort of get a feel for if an attorney "liked" that juror or not. In my mind I figured at least three of the potential jurors would not be selected. After each lawyer had asked their questions the judge called a brief recess to meet with the attorneys in his chambers. After about 10 minutes they all returned and the judge began with the first person, telling them they were either accepted or dismissed. Of the 14 potential jurors, 8 were accepted and 6 were dismissed, including the 3 I thought wouldn't make the cut, for whatever reason. By then it was close to noon so they drew 14 more names and then told everyone to break for lunch and come back at 1:15. When we met back we were told they needed 6 more jurors from the next 14. (Apparently during lunch one of the attorneys had used his discretion to dismiss another of the previously accepted jurors.) So we started the process all over again - the individual questions from the judge and then each attorney. By this time, I knew a lot more about the lives of 27 strangers and 1 acquaintance than I ever imagined! Finally the questioning ended, the judge and attorneys recessed to chambers and when they came back the judge began going down his list. Again I had correctly predicted who would be dismissed and they made it all the way to number 11 when they decided they had gotten the additional 6 they needed. The judge then thanked the rest of us and told us we were all dismissed and were free to leave. The bailiffs stamped the parking garage permits for those who needed it and we began filing out, most happy to be free - except for me! I never even got my name drawn to be considered! But I enjoyed the process. The day was not a complete waste, though, because it was the first day of "early voting" and I decided to excercise my other "sacred duty" and vote. I had pretty much made up my mind who I was going to vote for and had previously glanced at the 7 constitutional amendments so I was somewhat familiar with them. 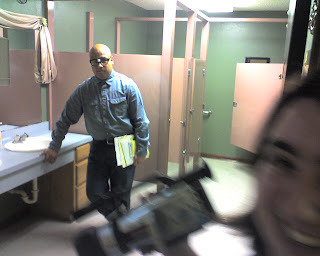 I used my trusty Treo 700p to go on the Internet to PAR's website to read their synopsis of the amendments and marched into the voter's registration office. Earlier the line had stretched way down the hall, snaking back on itself, but by now there were only a few people in line in front of me. The ladies working there told me over 800 people had voted so far that day, which indicates a pretty heavy turnout! After I voted, I proudly put on the "I Voted 2008 Presidential Election" sticker they were giving out, which I later attached to my Jury Duty summons as a momento of the day I participated in TWO of the most important responsibilities of any citizen - jury duty and voting! Hopefully this synopsis of the jury selection process will help someone else who gets one of those lovely notices in the mail. It's not a scary thing - and it's a wonderful opportunity for you to serve your country. It's important for the continuation of our freedoms. So don't forget to vote, even vote early (but not often! [G]) and when called upon to serve as a juror, do so with a sense of pride and patriotism. Not many nations enjoy the freedoms we have, that are continued by our participation in these important institutions. Until next time! 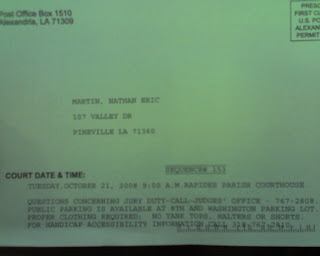 "You have been selected to serve as a Civil juror by the Rapides Parish Jury Commission. 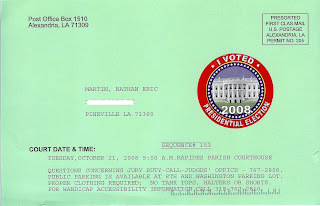 You are summoned to appear at the Rapides Parish Courthouse, Alexandria, LA, on the date and time indicated on the reverse side. FAIL NOT UNDER PENALTY OF LAW"
Now a lot of folks don't like this green card because it means your life is about to be disrupted. But I guess I'm odd. (You didn't need this blog post to tell you that, now did you?!) I super excited about jury duty! Ever since my high school civics class I've been fascinated by government. And believe it or not, I've longed for the opportunity to participate on a jury! To me it's one of the bedrocks of our free society, ranking right up there with the sacred right to vote. Two weeks from today we have the opportunity to help shape the future of our nation. And today I'm sitting in the courtroom, hoping my name gets called. It's a small price to pay to live in a country of such freedom and opportunity! After three months, my daughter Joy has returned from Mexico! At the end of our July missions trip to the Benito Juarez orphanage in Reynosa, Mexico, we left Joy to serve as an intern at the children's home for three months. While we've had ongoing contact with her via phone calls, text messages, etc, we haven't seen her since July. After three months Mark Russell, the orphanage director, brought her to McAllen, TX where Lori's dad lives and he put her on a non-stop bus to Houston where we picked her up. It was great to see her. 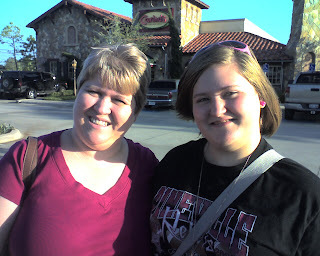 On the way home I asked her where she wanted to eat and the answer was easy for her - Johnny Carino's! So we stopped on the way home and had a nice supper. By the way, on our way home from Houston I stopped for gas in Baytown, TX because I saw gas prices so low I couldn't believe my eyes. I just had to take a picture - look there on the left - yes, that $2.97 for a gallon of regular unleaded gas! We paid $3.59 earlier the same morning when we filled up before going to Houston. Hard to believe a price difference of 62 cents in one day! 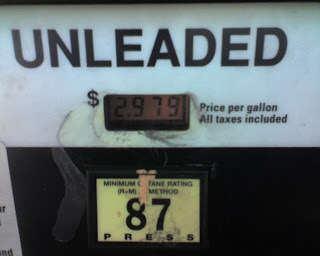 Of course, what's even more amazing is that I'm excited about paying $2.97 for a gallon of gas - a year or two ago I would have thought that was high-way robbery! Maybe that's the game they play - shoot it up real high, get us mad but used to it, then bring it back down a little bit and we'll be happy to pay 50% more than we were paying not that long ago. Argh!!! Last week Christian Challenge got into the movie business! We've been using videos in our services for a little while now, mainly for sermon illustrations, but we decided to do our first video recording on our own. 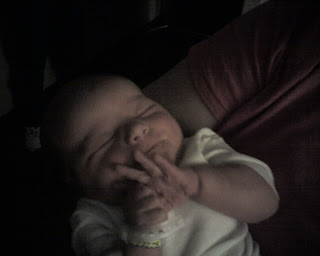 This was not for a sermon illustration but a "commercial" to promote our Community Groups. We got the idea from a video that was posted on GodTube. Rich Carlisle sent me a link and I thought it was pretty good. When I forwarded it to Jenni Baier to see if she could edit out the end and put our logo on it, she suggested that we try to shoot it ourselves. We batted the idea around in our staff meeting and decided to give it a shot. The first question was who was going to play the roles. 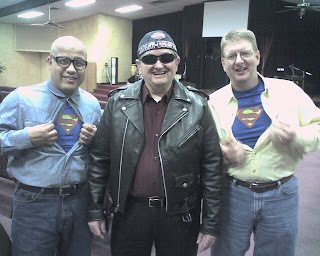 We instantly thought of Jon Martinez, our youth pastor, as the main character. 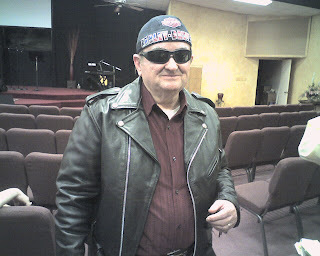 We thought about Bud Frederick for the last character but he suggested Rich Carlisle, our Community Groups coordinator. Then there was the question of who would play the "bully"? We tossed out the idea of my dad, Buddy Martin, and everyone thought it would be awesome but that he probably wouldn't do it. 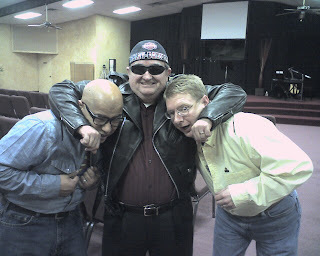 Believe it or not, he agreed to play the role of the "biker bully"! To the right is a picture of our three "stars" in character! That's it for this update. You never know what's coming next around Christian Challenge! And if you're interested in more information about our Community Groups, check out this link on our website. See you next time!